It’s an origin story that makes little sense. An 18-year-old kid from Scottsdale, Arizona – a place known for its cacti, golf courses, and desert nightlife – is the best prospect in hockey and the projected savior of the Toronto Maple Leafs. 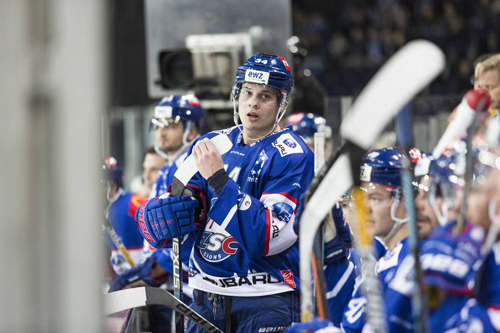 But to fully understand how Auston Matthews got to where he is, you need to know that when he was a boy, he spent thousands of hours on tiny rinks – not much larger than an end zone – fighting off two or three other kids, stickhandling in and around masses of skates and sticks to score a half-dozen goals every game. You need to learn about his skating coach, an eccentric Ukrainian named Boris who made players leap, pirouette and balance on their heels for so long they sometimes couldn’t walk the next day. The paper boy who can't stop growing. Even before he started taking the American Hockey League by storm this fall, the Leafs were already getting more Joe Colborne than had been initially received in that headline-grabbing trade with Boston last winter. Literally. Since coming to Toronto along with a first rounder for veteran defenceman Tomas Kaberle, Colborne has actually grown half an inch. Whether it’s delayed puberty or indicative that the 21-year-old still might have a future as an NBA 7-footer, Colborne has shot past the 6-foot-5 barrier and seems well on his way to 6'6". On October 2, 2001 I received a phone call from the coach of the Cornell Big Red inviting me to play for his hockey team next year. Cornell is an Ivy League Division I NCAA university. Its hockey program which is ranked 11th in the United States, has a history of sending players to the NHL. The typical student accepted there has a 92% high school average. Tuition and board costs $50,000 Canadian per year. Last week NHL central scouting told me I would be on their draft list and might be selected late in next June’s draft. The Dallas Stars and Tampa Bay Lightening have talked to my coach about me. WHEN YOU PLAY FOR 10 MINOR LEAGUE AND NHL TEAMS IN 11 SEASONS, YOU THINK A LOT ABOUT GETTING FROM HERE TO THERE. GRAEME TOWNSHEND HAS MADE A SECOND CAREER OF THAT IN TORONTO, WHERE HE IS NOW ONE OF JUST THREE NHL MENTORS WHOSE PRIMARY FOCUS IS SKATEWORK. 1.I WORK WITH WHAT I AM GIVEN.
" I help guys tweak their stride and technique to skate more efficiently. Most teams have a skating consultant who comes in during camp, but if you're not with the guys every day, you don't notice things. I study video and see how the game evolves. When people ask why pros need a skating coach at all, I say, "Tom Brady has a QB coach, and he knows how to throw a football. "There are always things you can improve." 2.I RELY ON ROLE MODELS. "My goal is to develop guys into dominant players before their contracts expire. What better way to do that than to use the dominant guys in the league as examples? Nicklas Lidstrom moves well laterally, which helps him in front of defenders. And Dion Phaneuf is great at positioning himself to get leverage for big hits. I teach the tactics those guys use." 3. THE BLUE LINE IS WHERE MY ACTION IS. "Most of my work is with defensemen, because their positioning is so important. At this level, forwards exploit tiny weaknesses, especially now that defenders can't clutch and grab anymore. But my role is pretty far-reaching. One day I'll work with a wing on tip-ins; the next, I'll focus on somebody's footwork while shooting." you almost never start from a dead stop. You'll be gliding and need to accelerate. So we work on the neutral takeoff: You put pressure on the balls of your feet instead of the toes, stay low, then push out instead of up." "Innovations spread faster than ever. Americans look to Canada for ideas and vice versa, but we're all influenced by Europeans. On YouTube, I can see a Russian kid's an amazing mover and have my guys practice it that day." Townshend Hockey Announces it's fourth NHL skating coach. I am proud to announce that Matt Rogers has been asked by our friends in the Buffalo Sabres and Portland Pirates organizations to come aboard as their skating and skills coach. Matt will be the Head Instructor at all Townshend Hockey Camps this summer along with Paul Vincent (Chicago Blackhawks), John McLean (Boston Bruins) and Graeme Townshend(Toronto Maple Leafs), giving us the most complete and comprehensive staff in the industry. "Matt has great inter-personal skills which allow him to get along with everyone which is essential to our success as a business" says Townshend Hockey President, Graeme Townshend. Matt has a great rapport with students and staff and has instant credibility as a result of his college and pro experience. "Matt is the best instructor I have ever had as he has also played professionally and knows what it takes to get to the pro ranks and now he will help other aspiring professional hockey players reach the ultimate goal of playing in the NHL. ", continues Graeme. Come and see the new P.U.C.K.S technology we are using this summer and the incredible, one and only Townshend Hockey skating machine, you won't believe this device, it will revolutionize the way skating is taught! This season, 10 local minor hockey teams came out to cheer on the Marlies and compete in the Rogers Fastest Skater challenge as part of Rogers Minor Hockey Nights. On Sunday, April 11th each team’s winner returned to Ricoh Coliseum to compete for the title of Rogers Fastest Skater during the last Marlies game of the season. After catching the action from the Rogers Red Zone with their family and friends, the skaters took to the ice during the second intermission in front of a crowd of 5,500. Finalist Sebastien Moschetta from the Credit Valley Wolf Cubs was unable to participate due to a recent injury but helped cheer on the other skaters from the Marlies bench. The remaining finalists were divided into three preliminary heats based on their qualifying times. The only girl in the finals, Emma Langlois from the Etobicoke Dolphins was ecstatic to learn she had received a bye into the semi-finals for having the fastest qualifying time. After five extremely close and exciting races, Vaughan’s Chris Emma just edged out Langlois in a photo finish to take home the title and trophy, along with a team party courtesy of Rogers and the Toronto Marlies including ice time at Ricoh Coliseum, a Marlies dressing room tour and tickets to a regular season 2010-2011 Marlies game. LEWISTON — The Lewiston Maineiacs' skate blades sliced a bit deeper into the ice at the Androscoggin Bank Colisee on Wednesday. The players had a bit more zip to their strides, they carved out crisp corners and accelerated more quickly with the puck. After three losses in a row in which they were outscored 18-4, it was a practice the Maineiacs desperately needed. And they got three of them this week, under the watchful eye of the only player born in Jamaica ever to play in the National Hockey League, Graeme Townshend. Catch a Maple Leafs practice these days and you're bound to see something new. On Saturday, for instance, at the end of the morning skate prior to that night's rousing victory over the Montreal Canadiens, there was 22-year-old rookie defenceman Phil Oreskovic with a stick in each hand, skating backward at medium speed between the two blue lines, pivoting and then doing the same drill again. And again. "Yeah, that's a new drill I made up just for Phil," Leafs skating instructor Graeme Townshend said in an interview later that day. Do You Know The Names In San Jose? If you want to skip the NHL playoffs' second round this weekend and make a pilgrimage to Jonathan Cheechoo's hometown, you'll have to drive eight hours north from Toronto to Cochrane, Ont., hop the Polar Bear Express for the five-hour train ride to Moosonee and then, because of melting ice on the Moose River, catch a helicopter to Moose Factory. This community of 2,700 off James Bay is the oldest English-speaking settlement in Ontario, dating to the 1670s. It's an old fur-trading outpost that is home to the Moose Cree First Nation, Cheechoo's tribe. The five-mile-square speck of land and history has an indoor rink and a Pizza Hut but no paved roads. It is a place where the mosquitoes are the size or Learjets and where boys' dreams were stunted until Cheechoo began scoring for the San Jose Sharks. Rookie defenceman Phil Oreskovic has turned some heads in his two games with the Leafs. The 6-foot-3, 217-pound Brampton native came up from the Marlies with the reputation as a strong defensive defenceman and a tough guy (he won a decision over the New York Islanders' Tim Jackman in Tuesday's 3-2 overtime victory at the ACC). But it's his skating that has surprised some people. He credits Leafs skating coach, Graeme Townshend, with helping him in that regard "Graeme's a tremendous, tremendous skating coach and he relates a lot of (practice) situations to game situations, which is nice because it doesn't get repetitive," Oreskovic said. Oreskovic said his teammates have pulled a couple of practical jokes on him, basically to keep him loose, such as placing a C on his jersey. We all like to do unique things for our players. Skating is one area where there are lots of products and people suggesting they can offer just such a thing. Well, we have a special guy for you and your team- Graeme Townsend. I had the pleasure of coaching Graeme in the AHL. He was known as a team player and a heart and soul type; he was not known for his skating. Graeme has changed that. He is the skating coach for the Toronto Maple Leafs and was in the same capacity with the San Jose Sharks. Graeme also played in the NHL with the Boston Bruins, New York Islanders, and Ottawa Senators. We had Graeme take over a team practice a couple of weeks ago. 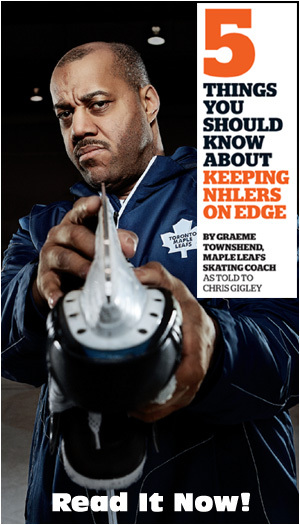 He demonstrated unique skating techniques that Graeme has perfected and uses with his NHL players. It was a great session. Graeme had the full attention of our Quebec major junior players as they were worked through drills teaching different game specific skating techniques. The session had a valuable motivational component as well. Graeme explained how he personally grew as a player and how these techniques he was presenting have helped others. Our players were left with practical drills to take away from the session that they have enthusiastically incorporated into our daily practice sessions. We are definitely having Graeme back to work with our players. We highly endorse Graeme and encourage you to do something special for yourself, or your team, and have Graeme become a part of what you do. Go to townshendhockey.com and proskatingcoach.com and check out the different camps that Graeme has available. This might be just the thing for you or your team. If you don’t know where you are going, you’ll never know if you have arrived there. People do not plan to fail they fail to plan. You must have a roadmap to follow in order to achieve your full potential as a player. Don’t be afraid to set big goals for your career. It is better to shoot for the stars and wind up reaching the clouds, than to shoot for the trees and wind up in the dirt. I am going to give you a real life story that will illustrate this fact. schools. I committed to the #1 ranked and eventual 1985 Frozen Four National Champion Rensselaer Polytechnic Institute (RPI). I had earned a full scholarship to play in the best program in the country! After being told by my coach and a few teammates that pro hockey would be a pipe dream for me, I went on to sign a contract with the Boston Bruins at the end of my senior year. The rest is just history. How did I do this? I certainly trained hard physically, but most importantly, I set goals for myself. I knew I had to get to the junior hockey level by my 19th birthday. I only had three years to make that dream a reality.